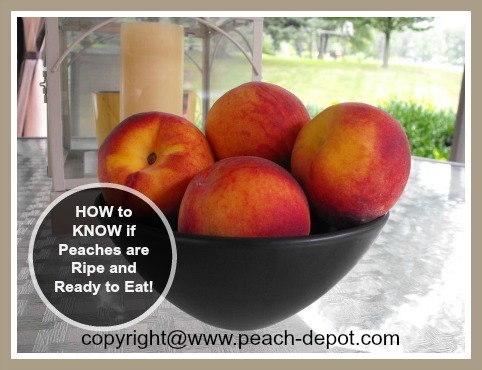 Wondering how to know if a peach is ripe and ready to eat? The only way to know for sure if a peach is fully matured is by delicately feeling it to test for ripeness. Peaches are categorized as "climacteric fruit". That means that peaches will ripen (get softer and sweeter) after they have been harvested. Other fruits, for example, grapes, cherries, strawberries and raspberries are "non-climacteric fruit"; once harvested, they never ripen further. Peaches are usually harvest when they are not fully ripe and firm to touch, and ripen fully a few days later. The baskets of peaches you may have just purchased probably need a few days to ripen. The colour of the peach is not indicative of the ripeness of the fruit. The blush or colour of the fuzzy peach skin varies according to the type or variety of peach, not the stage of ripeness. The only exception to colour as an indicator of ripeness is that in a fully ripe peach the skin immediately surrounding the stem will no longer have any greenish colour visible. Additionally the "background" colour of the peach will have changed from a very light greenish colour to a creamy or yellow background colour. A ripe peach will have a pleasingly sweet fragrance. 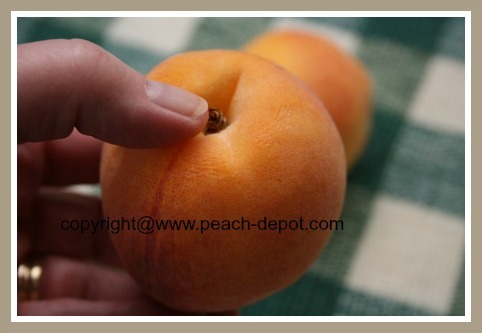 Very gently, hold a peach between your thumb and middle finger and press very lightly at the stem end of the peach. Be careful not to squeeze the peach as they bruise easily! One delicate squeeze is all that is needed. How Can You Tell if a Peach is Ripe? If the fruit indents slightly, the peach is fully ripe and ready to eat! A ripe peach will be soft to the touch, but not mushy. A "mushy" peach is an over-ripe peach. Over-ripe peaches will start to show signs of decomposition (fungus type spots) and the peel, or skin, often becomes "wrinkly". If you are planning to eat the peach the same day, or the next day, it is advisable to purchase a ripe peach or peaches. 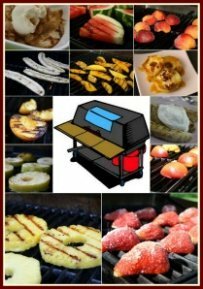 If you plan to eat the fresh fruit in a few days or make recipes with fresh peaches, it is advisable to purchase peaches that are firm to the touch, and that require a couple of days to ripen. 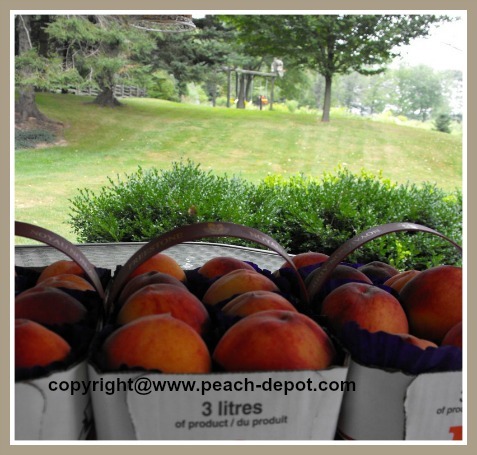 Sometimes it is possible to purchase baskets of peaches that include peaches at a few stages of ripeness. This is ideal, but in my experience most peaches in baskets purchased from the local grocery stores are made up of peaches that are all at the same stage of ripeness. 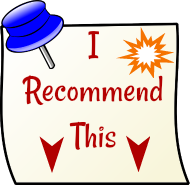 It is necessary to store unripe, fresh peaches in such a way as to allow them to fully ripen.